This page will provide you with a bit of background on prior photo exhibits and contests that featured extraordinary birds in the extended local area. In the past we have teamed up with Hunt’s Photo, as well as local conservation groups like Mass Audubon Blue Hills Trailside Museum and the Mystic River Watershed Association. Hunt’s has arranged for online auctions to help raise money through the sale of these matted and framed photographs for the benefit of the conservation groups, and done so with great success. These photo exhibits have attracted a lot of attention and interest from a wide range of people: bird and nature lovers, conservationists, and photography aficionados. The recent Bald Eagle exhibit was featured in a major story in the Boston Globe. We hope you will join us for the opening reception for the 2018 Peregrine Falcons: Breeding Cycle exhibit, and consider bringing your friends! © Ram Subramanian Photography | All rights reserved. By 1905 hunting and habitat destruction had decimated the Massachusetts Bald Eagle population. Nationally, the use of DDT, a dangerous chemical insecticide introduced in the mid-20th century, caused the Bald Eagle population to decline dramatically. This chronic and exponential population loss led to our national bird arriving on the federally Endangered species list in 1967! Valiant efforts to ban DDT and an elaborate plan to relocate forty-one Bald Eagles from Michigan and Canada to the Quabbin Reservoir in 1982 resulted in astonishing, steady population growth. Thanks to the successful relocation, and major efforts to protect and restore habitat, you can once again find this majestic bird perched in tall roost trees or gliding gracefully along the Mystic Lakes! While we celebrate one of the greatest conservation success stories of our time, our local photographers are skillfully documenting this remarkable homecoming. On Sunday, March 25th from 3:00-5:00pm, Hunt’s Photo and Video will host a free, public reception for their Bald Eagle Exhibit, a gallery featuring 20 breathtaking Bald Eagle photographs captured by local photographers. Marj Rines and Paul Roberts, local bird experts, will share remarks on the history of Bald Eagles in and around the Mystic Lakes and the extended watershed. Three winning photographs will be announced. 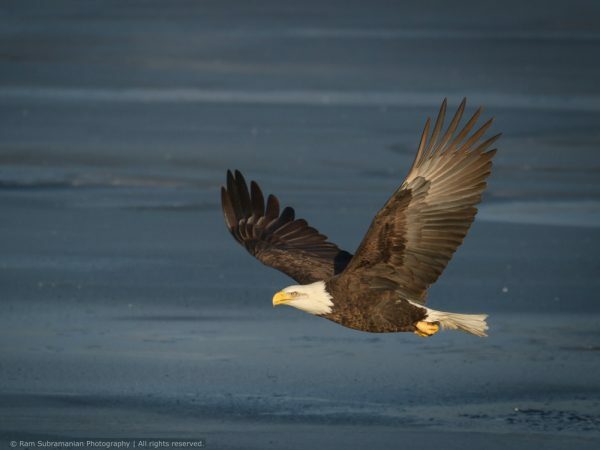 Marj Rines, of the Menotomy Bird Club, spoke to this new phenomenon saying, “twenty years ago I still hadn’t seen a Bald Eagle on the Mystic Lakes. Around that time, my aunt who lived in Winchester called to say she had seen an eagle. I was so jealous and spent a lot of time that winter searching until I finally saw one. I was terribly excited! Since then, it has become far more routine to see them. Some winters you can see 2-3 perched in trees or on ice at the same time.” The Menotomy Bird Club has it’s origins in the early Bald Eagle appearances- local birders would often run into each other on the Mystic Lakes searching for the eagles and built a community around these experiences. From March 1st- March 31st Hunt’s Photo and Video will also hold an online auction featuring the Bald Eagle images in the gallery. Visit the auction website (listed below) to place bids on these beautiful signed and framed photographs. Proceeds from the auction will benefit Mystic River Watershed Association, the Arlington-based environmental advocacy organization working to protect and restore the Mystic River, its tributaries, and watershed lands. Mystic River Watershed Association is thrilled to benefit from this auction and celebrate the natural history of the Mystic River with Hunt’s Photo and Video. Check out https://www.biddingforgood.com/Huntsphoto/baldeagle to view and bid on the images. Click here to read the Boston Globe article about Bald Eagles and Hunt’s photo exhibit. © Craig Gibson | All rights reserved. 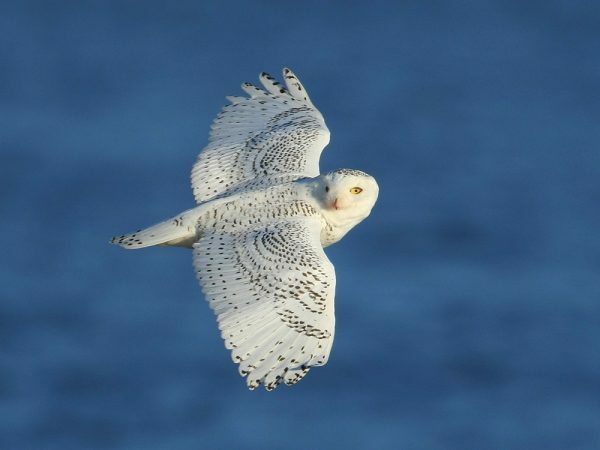 On Saturday, Nov. 1, from 5-7 pm, Hunt’s Photo & Video of Melrose will host a free opening reception for its first Snowy Owl Exhibit, a gallery show of breathtaking wildlife photographs taken during the snowy owl irruption of 2013-14. The event is open to the public. The exhibit will feature photographs culled from the widely watched Snowy Owl YouTube video produced by renowned bird photographer Craig Gibson of Winchester and will include images of snowy owls soaring, hunting, diving, and perching in areas as diverse as Cape Cod beaches, urban landscapes and Logan Airport runways. Photographers from across the state will be represented in the show, including local photographers such as Shawn Carey, John Harrison, and Eduardo del Solar. In addition, Ray Brown, host of Talkin’ Birds Radio Show on WROL, Boston, WCAP, Lowell, and WATD, South Shore, Massachusetts, will be a featured guest, along with guest judge Wayne R. Petersen, director of Mass Audubon’s Important Bird Area (IBA) Program. Refreshments from Organic Ocean Sushi in Melrose will be served. The exhibit will remain on display throughout the month, including during the upcoming 38th annual Hunt’s Photo and Video Show on Nov. 7-9. Adding to the excitement will be an online auction of the exhibit photos from Nov. 1-20. Visit the auction website to place your bids on these beautiful signed and framed, 16″x20″ images. Proceeds from the auction will benefit the Snowy Owl Project of Mass Audubon, which works to band, track and protect snowy owls. Hunt’s Photo President Scott Farber says the snowy owl exhibit is a natural extension of the company’s growing relationship with the North American Nature Photography Association (NANPA). A longtime supporter of the organization, Hunt’s has partnered with NANPA and the Parker River National Wildlife Refuge in co-sponsoring photo weekends and tours of wildlife habitats on Plum Island.